Rock houses - residences carved out of rock outcrops - occur in a number of places in Nottinghamshire. The old Rock Houses at Mansfield, for instance, are generally well known to history lovers in the county, and various pieces of research have been done over the years into the families that lived there. Perhaps lesser known are the Rock Houses at nearby Newstead Abbey. 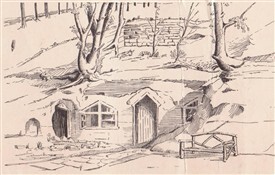 These were dwellings originally located within the park at Newstead, carved out of the same sandstone rock that is so workable and conducive to the creation of such habitations. 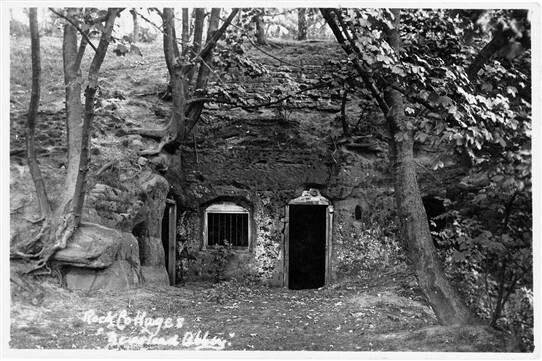 When much of Newstead Park was given by its last owner, Mr C. Fraser, to the Nottingham Corporation in 1931, the Rock houses lay outside this area (to the north), with the land - we believe - being sold to private individuals. Can anyone confirm whether this is correct, and whether the Newstead Rock Houses still stand? In their heyday the Newstead Rock Houses were occupied by the families of estate workers. The 1861 Census lists two “Rock Cottages” at Newstead, one being occupied by the family of Joseph College. Joseph was aged 65, a widower, and an agricultural labourer. Also living in his rock cottage are his son-in-law, William Horsepool (aged 36 and a shepherd), his wife Anne, and their children George, William and Jane – a total of 6 people in the tiny house. The second Rock Cottage listed in the 1861 Census was home to John Wall (aged 26, a Shepherd) and his wife and four children. The last Rock House resident is said to have been a Mrs Hay(e)s of Papplewick. This page was added by Website Administrator on 05/10/2018. I have in my possession an early postcard showing the same rock cottage that is depicted in the drawing. The card appears to show it abandoned - there is no door and the framing for the right side window is not present. It shows the walling above the cottage and the two openings to its left. I can scan and download it if required.